THE STORY - Lifelong buddies Willie (Morgan Freeman), Joe (Michael Caine) and Albert (Alan Arkin) decide to buck retirement and step off the straight-and-narrow when their pension funds become a corporate casualty. Desperate to pay the bills and come through for their loved ones, the three men risk it all by embarking on a daring adventure to knock off the very bank that absconded with their money. THE GOOD - The nostalgia factor of seeing three legendary actors ham it up. THE BAD - Bland jokes and uninspired storytelling despite three terrific leading actors. Imagine sitting in on a Warner Bros. studio staff meeting. A long oak table, with several studio executives sitting around a table brainstorming ideas for a new movie. Discussing the new up and coming talent in the world of cinema, attempting what their next move could be in terms of what movie to make next. When someone suddenly suggests, "What if, we make a film about three seasoned, senior actors who get fed up with the system. You know? How banks have become so complicated and why the retirement age continuously gets higher and higher. So these three friends, they decide to rob a bank!” And another studio executive says “Genius! Who could star? !” And another shouts “Uhhh, Morgan Freeman, Michael Caine, and Alan Arkin!” And they all relish in the brilliant idea they’ve just came up with? This is practically the foundation of the film "Going In Style," and let me tell you that small scenario I just made up is better than the actual film itself. 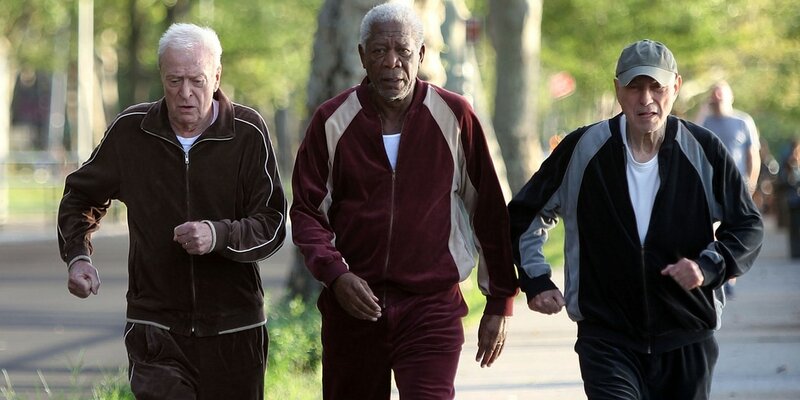 "Going In Style" revolves around three lifelong best friends: Willie (Morgan Freeman), Joe (Michael Caine), and Albert (Alan Arkin). Three senior citizens who are fired from their job at a steel factory due to attempting to make production at this factory cheeper. After being fired the pension checks that the trio receive, seize due to the banks shifting production to another country to make it cheeper. When Joe witnesses a bank robbery after discussing his mortgage payment with a banker, he inspires the rest of the group to try and rob a bank with him for; “If three young thugs can do it, why can’t we? We’re old, smart. And have nothing to lose.” Unfortunately the film does not develop such further than those simple sentences. Despite having an absolutely stellar selling point and a talented, nostalgic cast, the film does not take risks in terms of storytelling. In fact the film does not take any risks at all. It is so one dimensionally grueling, I almost walked out of the theatre. The story constantly repeats its minimal themes, and by themes I mean the exposition that each character preaches throughout the entire 96 minute runtime. Oh and by the way, those 96 minutes feel almost tripled. The film’s plot and scenes move slower than the trio of the actors and that’s saying quite a bit (Especially once you see the scene where Alan Arkin runs away, which actually becomes a crucial plot point, which deserves an entire point grade off on its own). Admittedly, the story does have a good premise, three senior citizens are fed up with how the system is now being run so they decide to make quite the drastic change. That is quite a fun premise, but the filmmakers fail to execute on this idea. The film takes way too long to actually get to the fun and games portion of the story. Before any banks are actually robbed the audience is spoon fed this overwhelming amount of fabricated inspiration behind the robberies. Each member of the trio has their own specific reasons for robbing the bank but each reason feels lackluster and fake. No “emotional” or “heartfelt” moment in the film actually feels emotional or heartfelt. And this isn’t a stab at the actors. The trio of Freeman, Arkin, and Caine are exciting to see on the screen. The coming together of three legends in a comedy film is really exciting. But for whatever reason the filmmakers fail to execute. Which is surprising considered who is attached. Theodore Melfie, the acclaimed director of "Hidden Figures," tackles the surprisingly boring screenplay. Zach Braff takes another stab at directing, making it his third feature film. Braff is usually effective in creating emotional moments in his films through the characters and the story. But with "Going In Style," Braff those these previous talents out of the window and just creates another basic studio comedy film. The film can also barely be classified as a comedy. The comedy is so hit and miss throughout the film. You can almost hear the crickets chirping in the theatre, one excruciatingly painful joke after another. As with most modern American comedies, the comedy is delivered to us through a basic standard coverage improv style. Versus hiring comedy writers or comedic professionals in order to deliver well written and hilarious comedy, we just get a few actors improving the comedy in each take hoping to land a few strikes of gold. Sadly, this does not pan out well for the film and makes it all the more painful of a watch. "Going In Style" is a painful, grueling comedy film that barely delivers on the comedy. With only one or two good laughs throughout the runtime, the film lacks in nearly every aspect. Poor direction, poor writing, poor use of great actors, all in all the film just cannot deliver. With fabricated themes and false moments of emotion, the film is a bore completely worth missing in the theatre and possibly even on DVD.